I used my new OF1400 for the first time today. It scratched the heck out of my (also new) Woodpeckers Variable Router jig. I am wondering is I shouldn’t have removed the plastic sheet on the base of the router? It is a quality control issue with the screws in the bottom plate. My OF1010 did the same thing to Corian. I was ticked. The chamfered holes didn't line up correctly a the factory for the screws holding the bottom plate on. Two of them were proud and needed to be removed, then make the shoe holes line up correctly by ovaling them out. Tried just tightening them more, but it was going to take more force than the metal pieces might have handled. The router screwed up your expensive jig. You should rightfully be ticked. I had the same issue with my 1010. It was only 1 screw that was proud of the phenolic but it really gouged the wood. As Peter said, identify the offending screw/screws and enlarge the countersink a little at a time until the screws are below the surface. Too bad about the Woodpecker MFS especially in the areas with the laser marked scale. How could they let this happen in the design or engineering spec. to start with? Make every chamfered hole deeper! I have not come across this issue with any other brands: Dewalt, Craftsman, Bosch, etc. That royally stinks! I haven’t seen this issue with my routers. You could fix it, if time is of the essence, but if you’re still within 30 days, send it back and get a new one. Or send it in for the service department to fix. You’re right, you can’t use than on any finished piece. Woodpeckers will sell you the replacement rails. I wouldn't mess with the screws on the router base plate until you call Festool to take care of all of your issues. I'm sure it's not a design or engineering spec issue but rather a manufacturing supplier issue. No one checks parts at the 100% level, either at the manufacturer or at incoming QA at Festool. They use AQL tables to establish the number of samples that are checked. Using the Acceptance Quality Limit means you choose the level of discrepant parts that will be acceptable for your needs. It's critical to choose the proper inspection level to use. Too tight and you can lose money by paying for too much inspection, too loose and you have the potential for accepting more discrepant parts than you want. Also, the method of manufacturing and the past history of the manufacturer can play into the various levels chosen. I'm sure it's not a design or engineering spec issue but rather a manufacturing supplier issue. The manufacturing supplier issue you pointed out is exactly what my point was about: if the engineering spec. made allowance for minor production issue (subject to tolerance). a slip in the QA process would not result in what the OP has experienced. Having larger chamfer/deeper holes on the baseplate would eliminate that. At least that seems to be the case for other brands' router plates. You don't need to inspect 100%, you need to do the tolerance stack in the first place and make sure the design won't allow this to happen unless a part gets made way out of spec, and that will get noticed even if they only inspect a small percentage of parts, they will notice if they are counterboring/countershinking hole correctly. Some of the issues I read about here, or even experience with Festool tools tends to make me think they don't go thru proper tolerance stack studies or work with good dimensional control (GD&T). They punt and put adjustments on tools instead. I've had a similar problem but not as bad as yours. My 1400 scratches surfaces in a particularly mysterious way; I've massaged the bottom of that thing six ways to Sunday and it still happens. I've reverted to using a supplemental base plate or just another router if it's a critical surface. Could the problem be fixed by filing down the top bit of the screw, using a fine file or coarse diamond hone? Thanks all for that advice. I'm going to see what Festool will say and send this router back. I would deepen countersink on the offending screw and move on. A 30 second fix, quicker than writing a post on FOG. I think protocol here would be: Get the router changed, you could as advised remove the screws and countersink a little deeper but, I’m guessing you’ll claim reimbursement for the damage? So, return the router as is for confirmation, get it replaced and get reimbursement for the damage. Good point about filing for damage compensation. And how would that correct the damage done to the Woodpecker's jig? I certainly would, it's completely ruined the jig which should be replaced, or at least the cost of a replacement. The other thing to take into account is, Festool would be glad to have a fault reported to them, so that they can eradicate it for future customers. The OP is doing Festool a service by bringing his experience (and his wasn't an isolated incident) to their attention. 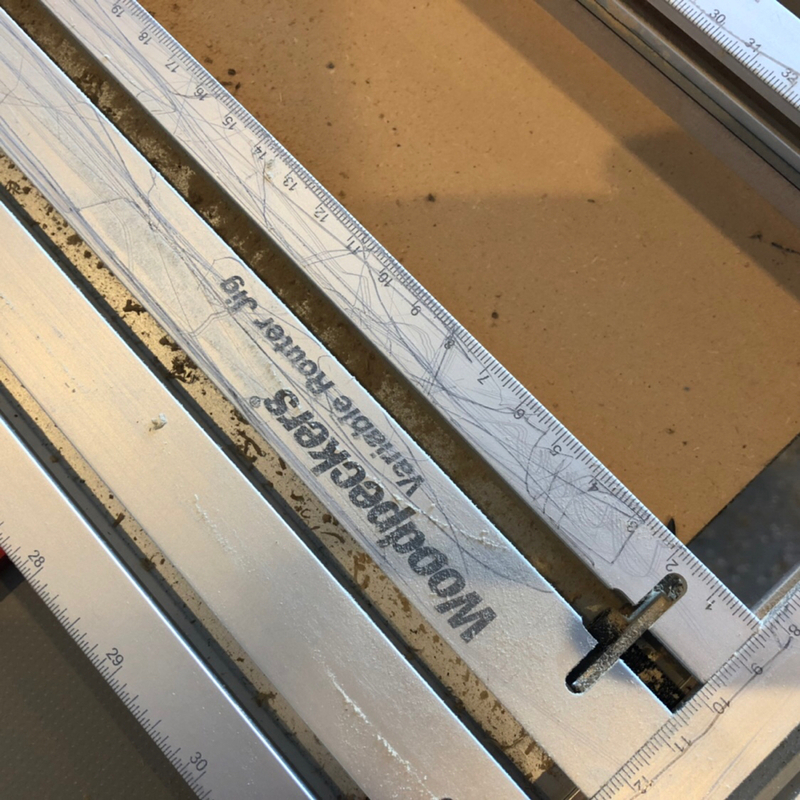 Festool should not only send a new router but also cover the rail replacement costs that Woodpecker might charge the OP. Then their engineers should work on fixing the potential issue for good (which isn't complex by any standards). I completely agree, and I'm sure it will be dealt with amicably. I had the same issue with my OF1400. Also one of the base screws (one of the 2 that were proud) was nearly stripped in the threads so when i tried to tighten it more to get it to seat, it fully stripped the hole. I was out of the 30 days so I sent it in for service. It was back within a week fully fixed, including a new base to deal with the stripped mounting screw. Of course this should not have been an issue in the first place, but I was very impressed with Festool service and how quickly the got it back to me. There was even a quick hand written note apologizing for the inconvenience. I appreciated that. Yes I agree, it should have been right first time but, the Festool CS does give peace of mind. Festool have fixed my router and resolved the issue it caused.